Italy commemorates the their favorite son, Christopher Columbus, on this fine 500 Lire piece. 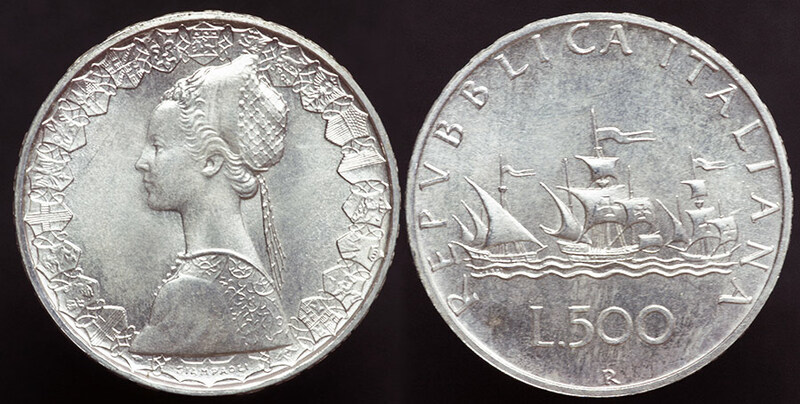 The obverse features a nice profile portrait of what has been described as a Renaissance Woman, there's no legend of any kind, just a border of shields, which I assume represents Italian states in the time of Columbus, who was born in Genoa. The reverse depicts the 3 ships (Santa Maria, Pinto, Nina)Columbus used to discover the New World in 1492. First struck in in 1958, the issue was struck until 2001, with the exception of 1971 - 1979. Proof-likes were struck every up until 1968 when proof were struck for almost every year (ex. 1983 & 4). Varieties exist for the year 1966 and perhaps earlier. The strike date appears in relief on the lettered edge, in this case 1985, with 74.6k struck for this year. KM values the proofs at much less than the business strikes, for this year only 15k were struck, yet they value the proof at nearly half, that's odd.